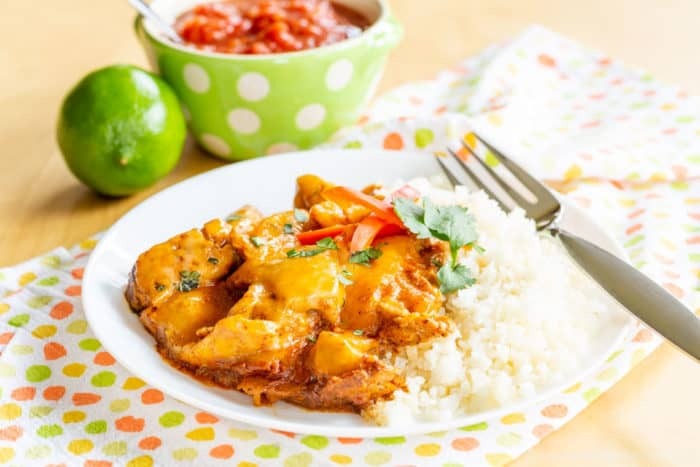 Chicken Enchilada Skillet is the best part of chicken enchiladas, with no tortillas needed when you serve it over cauliflower rice or even in lettuce wraps, which makes it even easier than rolling up each individual enchilada. This one pot meal is one of the most family-friendly easy low carb dinners with yummy kicked up Tex Mex flavors everyone loves. 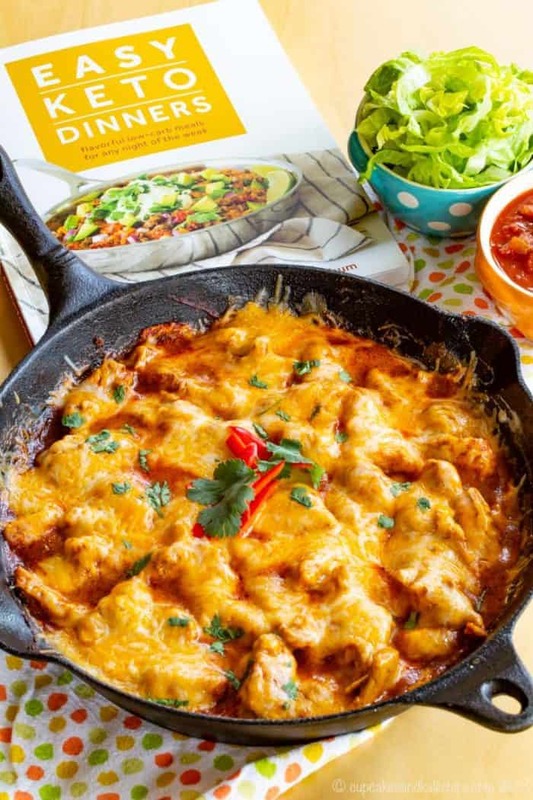 In about 30 minutes you can make this cheesy chicken enchilada skillet recipe to put a keto twist on Taco Tuesday. 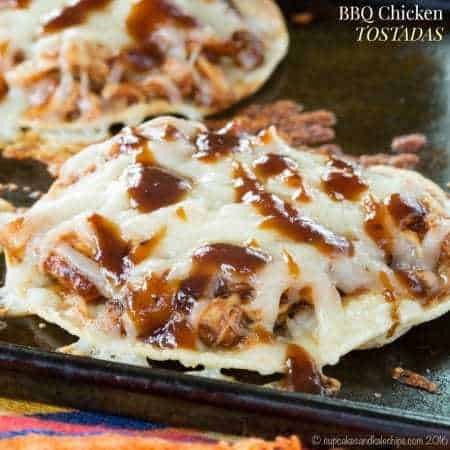 And this easy low carb dinner is definitely delicious Gluten-Free Cinco de Mayo Food. The first time I heard of the keto diet, it was from my friend whose daughter was starting it to control seizures from a pretty severe form of epilepsy. Then I learned about the benefits of this low carb diet for diabetes control from my friend Carolyn Ketchum of the blog All Day I Dream About Food. Carolyn is kind of a rock star in the keto world, a rock star in the food blogging world, and also just an all-around awesome person. She creates some of the most amazing low carb recipes you’ve ever seen. Sure, things like steak and chicken and veggies are staples of the keto diet, and she has amazing recipes for Sheet Pan Chicken and Vegetables and Grilled Steak with Garlic Cilantro Butter, but Carolyn is truly the queen of low carb desserts. I mean, being able to create recipes for Death by Chocolate Cheesecake and Chocolate Peanut Butter Buckeye Cake that you can eat without guilt takes a special kind of talent. And these days you can’t read health and fitness news or scroll through your Facebook feed without someone talking about their successes with weight loss, increased energy, mental clarity, or many of the other benefits of a keto lifestyle. I know many of my friends have gone keto, especially this year, and many of them took the plunge after being inspired by not only Carolyn and the recipes on her blog, but also her first cookbook, The Everyday Ketogenic Kitchen. This book is basically the condensed encyclopedia of keto, with background on the whys and hows, product recommendations, kitchen staples, and 150 recipes for every meal and snack of the day to keep you on track. We love the Extra-Beefy Spaghetti Bolognese recipe in that book, which was actually the basis for my Bolognese Stuffed Mushrooms. Easy Keto Dinners is packed with over 50 recipes that you can whip up any night of the week. 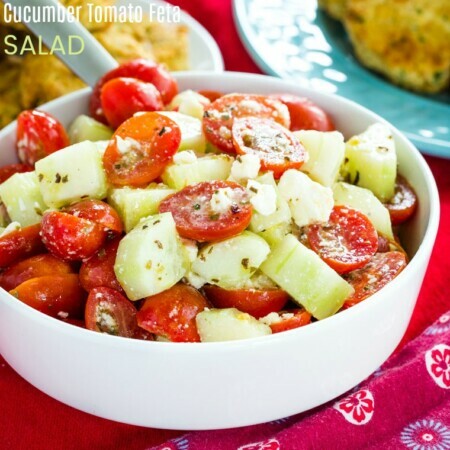 There are low carb dinner recipes for chicken, beef, pork, fish, and even vegetarian options. The Thai Chicken Salad is next on my list, as well as the Zucchini Pan Pizza (move over, cauliflower crust!). And before even diving into the recipes, Carolyn shares all of her best tips, tricks, and tools for making keto meals fast everyday. There are even icons on each recipe to denote those that you can make ahead and reheat, freeze for another time, cook in less than 30 minutes, or are made in the slow cooker, as well as denoting recipes that contain common allergens. Admittedly, I am not following a strict low carb diet. However, as someone with a gluten allergy, keto recipes are perfect for me as they are nearly always gluten free. That means I am always hitting up Carolyn’s website and books for recipes to make pancakes, muffins, pizza, and more. 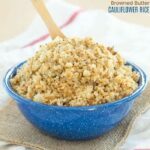 I also tend to go low-ish carb, particularly when it comes to my consumption of grains (or I suppose I should say limiting my consumption of grains), which is another reason keto recipes appeal to me. So I can attest that you don’t have to be following a keto lifestyle or diet 100% of the time to enjoy these recipes. 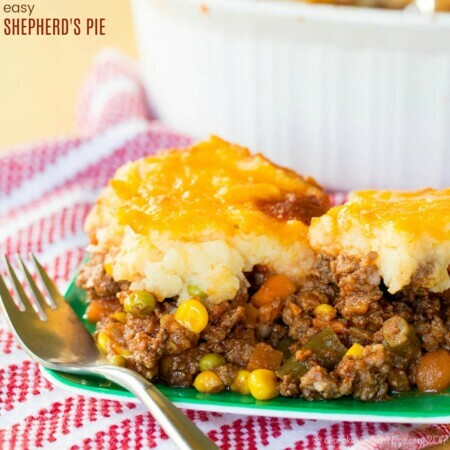 They are just flat out delicious, and since Carolyn has three kids, I know her recipes get the kiddo seal of approval, meaning they are perfect for my family as well. And while I might give the kids some tortillas with this enchiladas recipe or potatoes with the Instant Pot Meatloaf, I know they will still love the main course and I don’t have to cook two separate meals to keep my own carb count down. If you want to know how amazing this book is, let me just tell you I didn’t have to turn past the first page to find what I wanted to make first. This super easy, flavor-packed Chicken Enchilada Skillet was a hit with everyone in my family, from the five-year-old to the hubby. In fact, the eight-year-old had no school the next day, and when Daddy got home form work, he told him that for lunch get got to eat “more of that delicious chicken”. First you will brown the chicken in butter, and then simmer it in broth to cook it through. The directions call for you to discard about half of the broth after cooking. My stove tends to run a little hot, so I think I evaporated a little more of the broth. If your stove has crazy flames like mine, even on low, I’d recommend pouring it off into a bowl and then adding back if you need a little more liquid, as I did. Use your favorite cheddar cheese and shred it yourself, or pick up a shredded Mexican cheese blend. I had just received the new 4 Cheese Mexican Shredded Cheese from my firneds at Cabot, and that worked perfectly. Carolyns also mentions that you can make it even faster by picking up a rotisserie chicken at the grocery store and reducing the amount of broth. 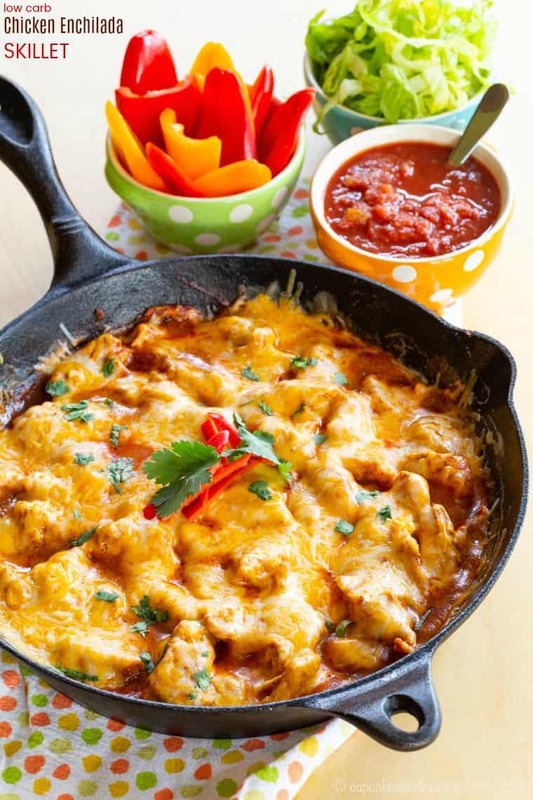 What do you serve with Chicken Enchilada Skillet? You can serve this Chicken Enchilada Skillet over any type of cauliflower rice, even the frozen kind, but you can also make Browned Butter Cauliflower Rice for an explosion of flavor with just a touch of butter. In the Easy Keto Dinners book, Carolyn also has a recipe for Pork Rind Wraps, or you can scoop it up like nachos with mini bell peppers. 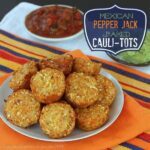 Mexican Pepper Jack Baked Cauli Tots can be made with almond meal in place of the cornmeal to make them low carb for another cauliflower side dish option. 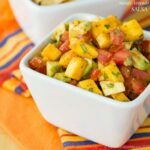 Mango Avocado Salsa would add some fresh flavor on top of this chicken enchilada skillet, just watch your serving size to keep it low carb. 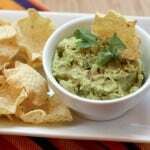 Kid-Friendly Guacamole has the flavors you love without the chunks of raw onions and jalapenos that the kids don’t like. Don’t forget your other toppings like lettuce, tomatoes, and sour cream. 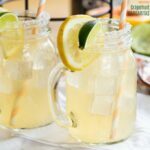 Mix up a batch of Skinny Grapefruit Margaritas, but sweet with a low carb honey substitute or another low carb simple syrup. Cookin’ Canuck made Grilled Cilantro Lime Chicken, which is so easy and versatile. Chicken Parmesan Casserole made by Shelby of Grumpy’s Honey Bunch is a keto version of classic comfort food. And you have to check out this Low Carb Stuffed Pepper Soup from Carolyn’s newest book, Keto Soups & Stews! What do you need to make chicken enchilada skillet? 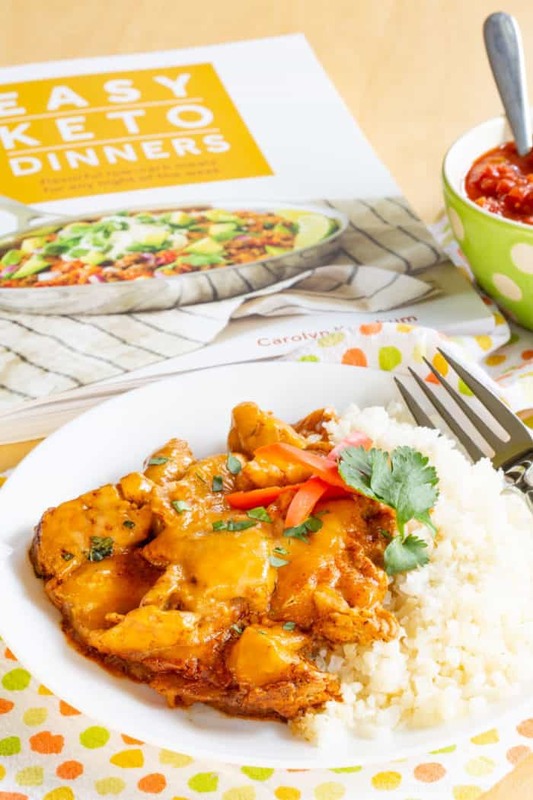 Even though I give you the recipe here, you should definitely pick up Carolyn’s book Easy Keto Dinners for more recipes and tips. A nice, big skillet is key. I used cast iron and love the flavor it gave for how the butter browned on the chicken so nicely. 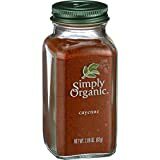 Since you only need two tablespoons of tomato paste, one of those tubes of tomato paste that you can keep in your fridge is a great thing to have on hand. 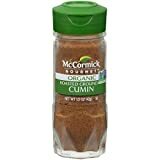 Keep your spice cabinet stocked with chili powder, garlic powder, cumin, and cayenne pepper so you can always throw together a Tex Mex dish in a pinch. And I love this handheld paddle cheese grater for shredding cheese right on top of whatever you are making. Since Carolyn is, in my eyes, the Queen of Keto, I consider her cookbooks the absolute authoritative sources on low carb cooking and baking. I don’t always eat low carb. But I am gluten free and do try to watch my consumption of grains. So her recipes fit well into my lifestyle. 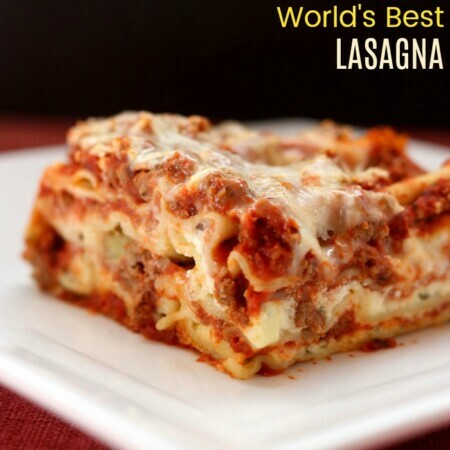 And for my husband and kids, they are versatile enough that I can always add rice or pasta on the side while I enjoy my gluten free and low carb meal. Get cozy with Keto Soups & Stews. To share Carolyn’s words about this recipe, “Who needs tortillas with their chicken enchiladas? The fillings and the sauce are the best part anyway, and this skillet dinner is so much easier to make.” You can have this easy low carb dinner recipe on the table in about 30 minutes, and the kids will go crazy for it while you stick to your low carb lifestyle. In a large skillet over medium heat, melt the butter. Season the chicken generously with salt and pepper. Brown the chicken in the butter for about 2 minutes per side. Add the broth and bring to a simmer. Cook for 12 to 15 minutes, until the chicken is cooked through. Remove the chicken to a plate and remove about half of the broth from the skillet. Discard the broth. Whisk the tomato paste, chili powder, garlic powder, cumin, and cayenne into the remaining broth in the skillet. Shred the chicken with 2 forks. Reduce the heat to low and whisk in the sour cream until well combined. Stir in the chicken. Sprinkle the cheese over the top and cover the skillet until melted, about 4 minutes. Serve with cauliflower rice and your favorite enchilada toppings, like pickled jalapenos, cilantro, guacamole, and tomatoes. This was so good and easy to make! I’m so happy to hear that you enjoyed the recipe, Phil. Thank you for your comment and for rating the recipe! I’m so glad you enjoyed the chicken enchiladas, Sarah! Thanks for rating the recipe, too. Sooo tasty!!! First review I’ve actually left for a recipe. I will hands down make this again. Word of advice, this feeds 3 people comfortably. If you want left overs, or to feed 6 people like it says, double it. I’m SO happy to know that you enjoyed the enchiladas, Briana. Serving sizes are so subjective, aren’t they? I mean, my husband can eat enough for two people sometimes, and kids eat a half serving. Regardless, thank you for the rating! How very nice of you, Briana! I hope that everyone enjoys it. Thank you for rating the recipe! I would have never thought to use cauliflower! I love this dish and it’s filling! I’m so happy to hear that you are enjoying the recipe, Anquilla. Thank you for your comment and recipe rating! A home run Brianne. Absolutely love this low carb option. This came out very well. Never heard of Mexican cheese. Must look it up. Guess I am a heathen who needs to learn. LOL. Haha! A heathen?? I don’t think so. Anyway, any type of Mexican cheese works well in this recipe. They melt REALLY well for that ultimate, ooey gooey cheesy goodness. Fabulous! This is my new go to dish when I’m craving Mexican. I’m so glad to hear that you enjoyed the recipe, Susan. Thank you for your comment and for rating the recipe!